King's Cross Church is a new church located in Pacific Beach, San Diego CA. Our inaugural service was held on Sunday March 4, 2018. In thinking through names, we wanted a name that communicates what the church is all about. We also wanted a name that was timeless. A name that honored the past, and looked forward to the future. And 'King's Cross Church' clearly communicates what we're about. We're all about Jesus, the King of kings (Revelation 17:14), who lived a sinless life (Hebrews 4:15), died on the cross and rose on the third day in order to save sinners (1 Corinthians 15:3-4) and bring them together as his church (Colossians 1:18). We’re about knowing Jesus, and making Him known. This is our mission. And our mission and purpose and calling as a church is based on Matthew 28:16-20 which is known as the Great Commission. make and mature FOLLOWERS of Jesus. In other words, we desire to be a church made up of disciples, who are making disciples. A community made up of people who are knowing Jesus, and always seeking to make him known to others. A transformative community with the sole purpose of learning and living Christ the King. We're a church that looks inwards; to grow in Jesus. But also, looks outwards, to help people know Jesus. Born in Ghana, Obed relocated to London, UK at just six years old. Elena, on the other hand, was born into a Greek family who lived in North London all of her life. Revelation TV a UK Christian television channel was where Elena and Obed met. The two charismatic TV hosts found chemistry on and off screen, their friendship developing into a deep love. In 2008 they tied the knot and 2 years later they moved from the sweeping, grey landscapes of London to bright and sunny Los Angeles. In the City of Angels, Obed pursued his Masters of Divinity at The Master's Seminary. Driven and passionate about his studies, Obed completed his Masters in 2014. 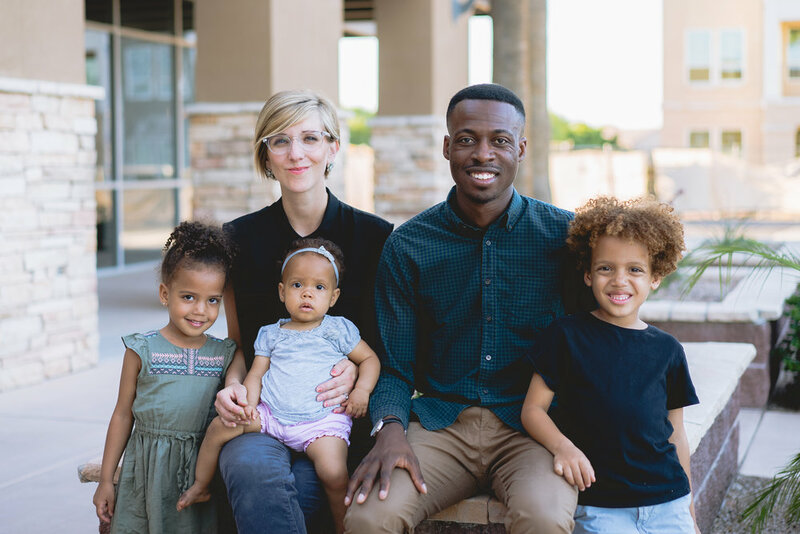 Following his graduation, he was brought on staff at Reality LA as a Pastoral Resident, with the goal of heading back to London to plant a church after his training. But during their time at Reality LA, the Brefos were exposed to the great need for churches in Southern California. This exposure created within the Brefos a desire to plant a church in Southern California. After hearing about the need and an opportunity to plant in San Diego, they began to pray about the possibility. In 2016, they transitioned from Reality LA to the Harvest Training Center in Chicago to be equipped for a church plant. After the four month training, they moved to Arizona to intern at Harvest East Valley. Obed's education and experiences in ministry have provided him with the necessary skills to be a lead church planter -- he loves people and is passionate about making disciples within the context of a local church. Obed and Elena are blessed to have three American children (Jesse is 6, Keziah is 4 and Eden is 2). We are incredibly grateful for our Advisory Team. They provide coaching, wisdom and accountability for the leaders of King's Cross Church. As our young church matures, we will seek, by God’s grace, to develop humble servants to lead and to love our church as elders in the years ahead.